Ever since moving into my new student pad I've become obsessed with all things interior, and bronze accessories have become my weakness. 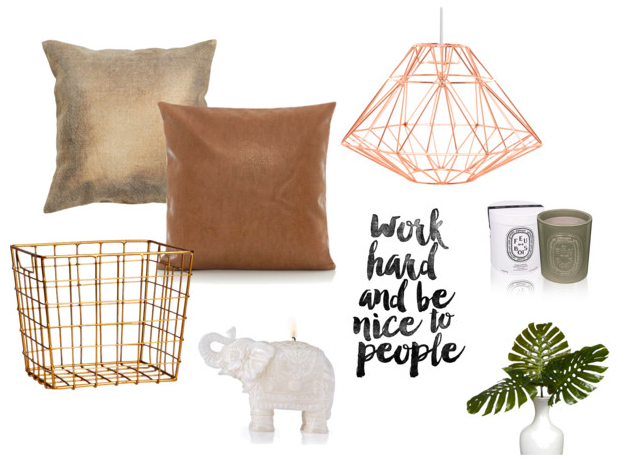 Living in student accommodation often means dreary lighting and peeling wallpaper - but with a little help from H&M home, something as simple as metallic cushion covers or an ornamental lampshade can really transform a room. Below is a round up of the current home items I'm crushing over, my favourite being this adorable elephant candle holder. I want all of these pieces!! Especially the light shade and the plant! Love all the tones in this, especially the bronzey pillows.